Villa Sandra grew out of a happy restoration of an old rural building, situated in an elevated position in the production zone of Chianti,only 'two steps' from the famous vineyards of Chianti Classico. 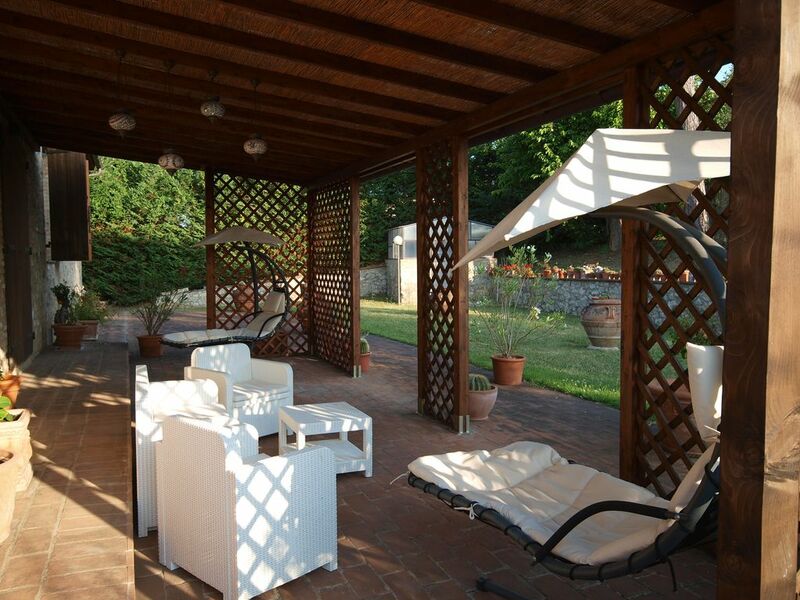 A large enclosed garden with private swimming pool (12 x 6 m) is very suitable for outdoor living and a relaxing holiday. You can get into the house either from the frontside through the living room or from the back through the kitchen, making it easier to access from the garden and the pool. The house has antique furniture, oriental statues and objects, that can be also purchased. A large and bright living room welcomes you on the top floor, hold the attention of art objects, each looking at it gives a new emotion, it is a house full of good energy for a good holiday. Five bedrooms can comfortably accommodate 10 to 12 people. Three bathrooms, two with shower, one with Jacuzzi. The kitchen downstairs is very large and equipped with everything, a dining table can accommodate 14 people. Convenient adjacent, furnished outdoor area makes dining outside and inside easier. Villa Sandra grew out of a happy restoration of an old rural building, situated in an elevated position in the production zone of Chianti,only 'two steps' from the famous vineyards of Chianti Classico. A large enclosed garden with private swimming pool (12 x 6 m) is very suitable for outdoor living and a relaxing holiday. You can get into the house either from the frontside through the living room or from the back through the kitchen, making it easier to access from the garden and the pool. The house has antique furniture, oriental statues and objects, that can be also purchased. A large and bright living room welcomes you on the top floor, hold the attention of art objects, each looking at it gives a new emotion, it's a house full of 'good energy' for a good holiday. You can ask for the original Thai massage at home. Five bedrooms, one with a queen bed and two sofa's can comfortably accommodate 10 to 12 people. Three bathrooms, two with shower, one with Jacuzzi. The kitchen downstairs is very large and equipped with everything, a dining table can accommodate 14 people. Convenient adjacent, furnished outdoor area makes dining t outside and inside easier. An experienced cook can, if desired, cook typical dishes of Tuscan cuisine. Villa Sandra grew out of a happy restoration of an old rural building, situated in an elevated position in the production zone of Chianti,only 'two steps' from the famous vineyards of Chianti Classico. A large enclosed garden with private swimming pool (12 x 6 m) is very suitable for outdoor living and a relaxing holiday. You can get into the house either from the frontside through the living room or from the back through the kitchen, making it easier to access from the garden and the pool. The house has antique furniture, oriental statues and objects, that can be also purchased. A large and bright living room welcomes you on the top floor, hold the attention of art objects, each looking at it gives a new emotion, it's a house full of 'good energy' for a good holiday. You can ask for the original Thai massage at home. Five bedrooms,can comfortably accommodate 10 to 12 people. Three bathrooms, two with shower, one with Jacuzzi. The kitchen downstairs is very large and equipped with everything, a dining table can accommodate 14 people. Convenient adjacent, furnished outdoor area makes dining t outside and inside easier. An experienced cook can, if desired, cook typical dishes of Tuscan cuisine.